Baker, A.j.. "Sandpiper". The Canadian Encyclopedia, 23 March 2015, Historica Canada. https://www.thecanadianencyclopedia.ca/en/article/sandpiper. Accessed 22 April 2019. Sandpiper is the common name for family Scolopacidae of shorebirds. 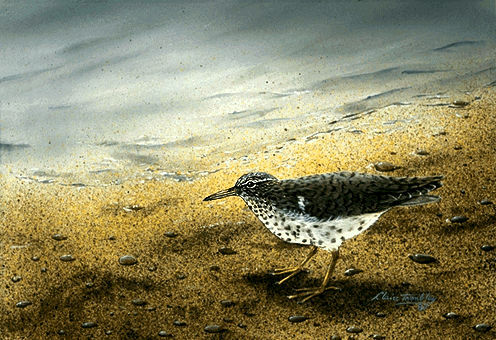 Of the typical sandpipers, the spotted is the most widespread, breeding all across southern Canada (artwork by Claire Tremblay). Sandpiper is the common name for family Scolopacidae of shorebirds that includes true sandpipers, snipes, turnstones, woodcocks, curlews (see endangered animals), dunlins, godwits, knots, sanderling, surfbirds, tattlers, yellowlegs and willets. Typical sandpipers have been classified recently in 2 separate tribes, Tringini (18 species) and Calidridini (24 species). True sandpipers breed at high latitudes in the Northern Hemisphere and undertake long migrations, wintering in Australia, New Zealand, Asia, Africa and South America. 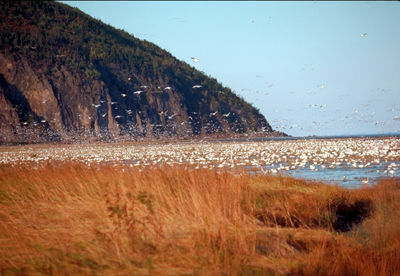 Species commonly seen in Canada include spotted, solitary, semipalmated, white-rumped and pectoral sandpipers (Actitis macularia, Tringa solitaria, Calidris pusilla, C. fuscicollis, C. melanotos, respectively) and dunlin (C. alpina). Sandpipers are distinguished from plovers by their proportionately longer and thinner bills, elongated legs, cryptically coloured plumage, and hind toe (in all but sanderling, C. alba). They range in size from the 21 g least sandpiper (C. minutilla) to the 200 g great knot (C. tenuirostris). 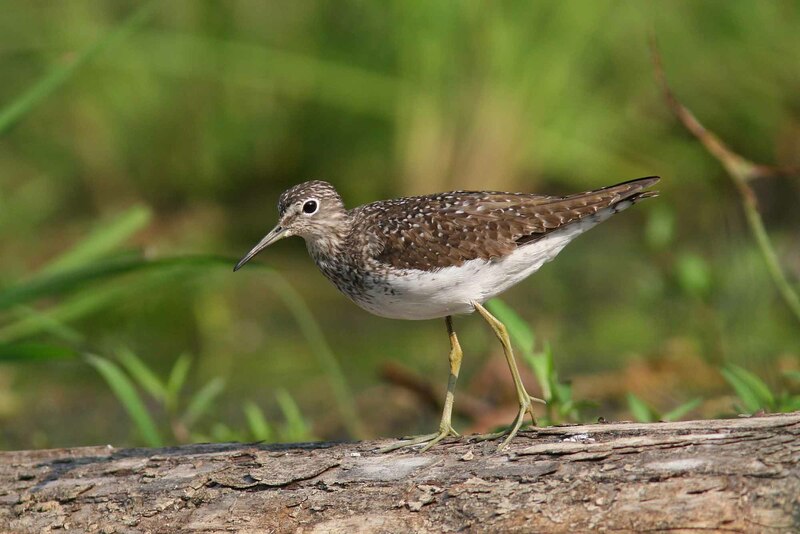 Sandpipers have various soft calls that have earned them the popular name "peeps" in North America. After breeding season sandpipers gather in flocks of one or more species. In flight these flocks are remarkable for the precision with which they wheel and turn. 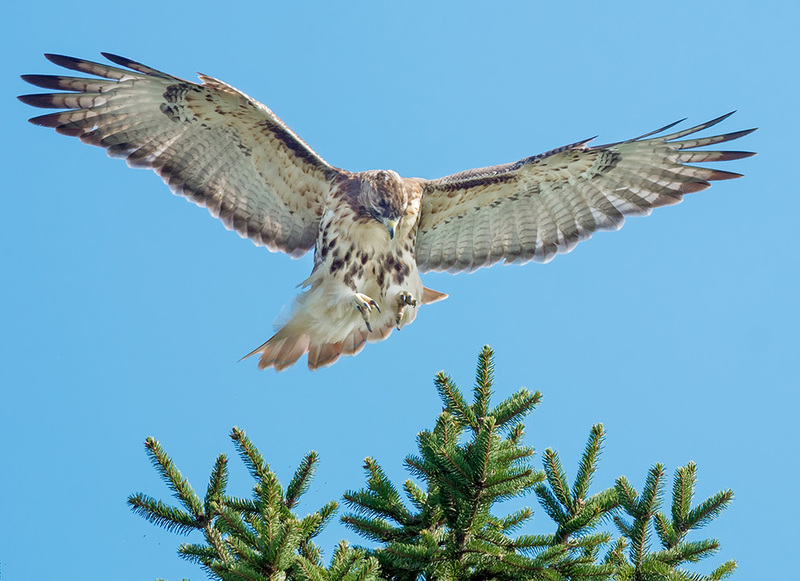 The alternate flashing of white ventral plumage and grey dorsal plumage seems to confuse birds of prey by making it difficult to single out an individual for attack. 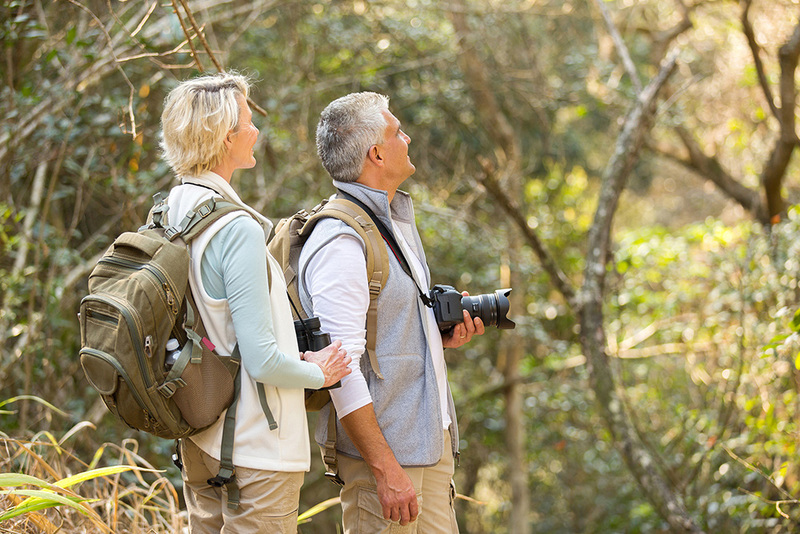 No other group of birds has such diverse breeding systems. Most sandpipers are monogamous, laying 1-2 clutches per breeding season; some (eg, dunlin) are polyandrous with different males incubating successive clutches laid by one female; others (eg, white-rumped sandpipers) are polygynous with one male mating with more than one female. A clutch usually contains 4 eggs (range 2-5). Incubation takes 18-32 days, depending on species. Young leave the nest soon after hatching. Like plovers, sandpipers guard their young and often use distraction displays to lure predators away from eggs or chicks.